Trump is referring to a Washington Post article that disclosed that then-national security adviser Michael Flynn privately discussed U.S. sanctions against Russia with that country’s ambassador to the United States during the month before Trump took office, contrary to public assertions by Trump officials. The Post report prompted a firestorm that led to Flynn’s firing by Trump, because it turned out that Flynn had misled Vice President Pence and other administration officials about whether he had discussed sanctions. The article cited information provided by “nine current and former officials, who were in senior positions at multiple agencies at the time of the calls.” (Calls by the Russian ambassador are monitored by intelligence agencies.) No White House official has disputed the accuracy of the article — and indeed, it resulted in Flynn’s departure from the administration. Trump listed five mainstream media organizations — the New York Times, NBC, ABC, CBS and CNN — as the “FAKE NEWS media” and declared that they are the enemy of the American people. By listing major media organizations as the enemy, Trump was clearly making a statement about the broader news media. The primary election rules of the Democratic Party require a combination of 4,051 delegates elected through primaries and 714 “superdelegates” (elected officials and other influential Democrats who can back whomever they want). Superdelegates make up 15 percent of the total delegate pool, and Clinton would not have obtained the 2,383 delegates needed to clinch the nomination without the support of superdelegates. Trump says the system was rigged against Sanders because of the superdelegates. In June, when the media began declaring Clinton the presumptive nominee, Clinton was on track to win the nomination even without superdelegates. We dug into this in depth in a separate fact check. Trump is referring to the recent arrests of undocumented immigrants convicted of crimes, or the “bad dudes.” Trump takes credit for fulfilling his campaign promise of cracking down on illegal immigration, but these arrests are routine. Immigration and Customs Enforcement has always targeted dangerous criminals in enforcement priorities. The recent arrests, however, did include people who would not have fallen under narrowed enforcement priorities under Obama. Still, 25 percent of the arrests were of people who had lesser charges and noncriminal convictions. According to anecdotes of recent arrests, undocumented people with traffic violations were subject to arrest. They are not the “bad dudes,” such as drug dealers or murderers, that he describes. 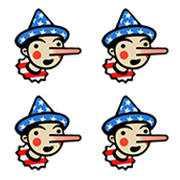 Trump essentially repeats a false GOP talking point that previously earned Four Pinocchios. The Obama administration calculated that about 20 million people have gained health coverage as a result of the Affordable Care Act, a figure that seems reasonable. Meanwhile, the number of plans that were canceled is far lower, though there appears to be no research that has determined exactly how many people had their policies canceled because the health insurance did not comply with the ACA. An estimated 2.6 million people received notices of cancellations, but there was such an outcry over reports of cancellations that the Obama administration rushed to issue waivers that would allow people to keep their plans. Forty states accepted the waiver policy — which in most cases remains in effect until December 2017. So a vast majority of the people who might have received notices actually were able to keep their plans, even up until today. It’s important to remember that the individual insurance market has a lot of ebb and flow, with people moving in and out of it as they change jobs, so the odds are many people who might have been affected by plan terminations would have already switched plans. One study found that in the 2008-to-2011 period, only 42 percent of policyholders in the non-group market retained that coverage after 12 months, with many moving to an employer-provided plan when obtaining a new job. This is one of Trump’s favorite claims. Federal agencies can’t endorse political candidates. The unions representing Immigration and Customs Enforcement agents and Border Patrol agents did endorse Trump. Both groups said Trump was their first-ever endorsement. But they did not do so unanimously. The National Border Patrol Council endorsement was based on the vote of 11 union leaders, which sparked controversy among union members. Agents in El Paso, in a 14-to-13 vote, narrowly failed to have the local union disavow the endorsement. Seven people were shot and killed in Chicago on Wednesday, the deadliest day in the city so far this year. Homicides in Chicago are on track with the same period in 2016, when Chicago recorded the most homicides in two decades, the Chicago Tribune reported. Overall, violent crime is on a decades-long decline since the height of the crack cocaine epidemic in the early 1990s. In 2016, there was an uptick in the homicide rate in the 30 largest cities. It’s too early to say whether this uptick indicates the return of a crime wave. One outlier city, Chicago, was responsible for 43.7 percent of the total increase in homicide rates in 2016. Trump continues to focus on one outlier city, whose violence — while a growing concern for local officials — is not representative of overall national trends. 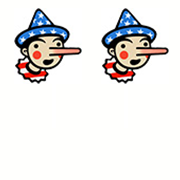 For more, check out our in-depth fact check on Trump’s rhetoric on crime. Trump constantly changes the number of jobs that might be created by the pipeline. This is a high-end estimate that we have previously given Two Pinocchios. The pipeline project would create short-term jobs, lasting on average 19.5 weeks, to assemble the pipeline that would help carry heavy crude oil from Canada’s Alberta province to the gulf coast. Those short-term jobs were calculated by the State Department to be the equivalent of 3,900 annual jobs. About 16,000 jobs (including nearly 4,000 in construction jobs) would stem from direct spending, such as building the high-strength line pipe. The other 26,000 jobs are even more fuzzy — what are termed “indirect and induced spending.” Some of that could be goods and services purchased by contractors, but it also means spending by employees working for a supplier of goods and services. An appendix to the State Department report, for instance, says that 634 people would be employed in the “arts, entertainment and recreation services” in the United States as a result of Keystone — and only 138 of those jobs would be in the construction states. No dancer in New York City is going to get a job because of Keystone, but just as the part-time work of the construction workers adds up to jobs expressed in annual terms, the economic model assumes some of that spending reverberates through the economy and eventually lands in the pockets of people across the country, thus contributing to a portion of their annual wage. The State Department report adds an important bit of context — the pipeline project would represent just 0.02 percent of annual economic activity across the nation. Meanwhile, the January jobs report, showing 230,000 jobs were created, reflects the last month of the Obama administration. The data was collected in early January, when Obama was still president. Trump had referred to rising crime rates in Sweden, but the country’s overall rate has fallen in recent years. Sweden has welcomed refugees and immigrants, but Swedish crime experts do not agree that the country’s immigration policies are linked to crime. Just two days after Trump made his false claim, riots broke out in a predominantly immigrant neighborhood in Stockholm, the country’s capital. That neighborhood was the scene of riots in 2010 and 2013, stemming from anger directed at the influx of refugees and migrants into the country. “Obamacare covers very few people – and remember, deduct from the number all of the people that had great health care that they loved that was taken away from them." "Ford and Fiat Chrysler, General Motors, Sprint, Intel, and so many others are now, because of the election result, making major investments in the United States." “But it was a little rigged against him [Bernie Sanders], you know, super delegate, super delegate." “The dishonest media did not explain that I called the fake news the enemy of the people. The fake news. They dropped off the word ‘fake.’ "